Only parts list and common sence. A breadboard is usually used to prototype circuits before soldering them into place permanently, though when building robots you may even want to make a breadboard a standard fixture. Having started with a BOE-Bot I'd become used to having a breadboard available to me. After having upgraded my Micro Controller for a bigger and better one I figured why not do the same with the breadboard. This tutorial is an introduction into breadboards for the total new comer. I bought it from Maplin for less than �4, its made up of one of AD-4D which is the long thin red and black strip at the top and one AD-100 which is the main breadboard work area underneath (its possible to attach power to the AD-100 without the use of AD-4D but it can be less practical as this would only supply power to the vertical rows that the current was attached to (up to the central divide) where as we can power the entire area between the red and black lines on the AD-4D and then tap into the current when and where we need to. There is also a sticky back pad underneath so you can easily/securely attach it to you project. Attach one end of the resister to (j-17) and the other to any hole in the rows just below the red line. Now attach that piece of wire with the two stripped ends thats been lying there, placing one end in the hole marked (j-15) and the other in any of the holes in the rows just above the black line. Attach the power lines to their corresponding rows (black wire in to any free hole just above the black line, red wire into any free hole just below the red line.) Is it flashing? IF Yes - You've completed your first circuit! You should see the LED Light up and be currently giving yourself a pat on the back for appreciating the value of expanding ones mind. The possibilities as with robotics are pretty much endless and this really is just a simple circuit, breadboards are widely used and there are lots of sources of information the new comer. 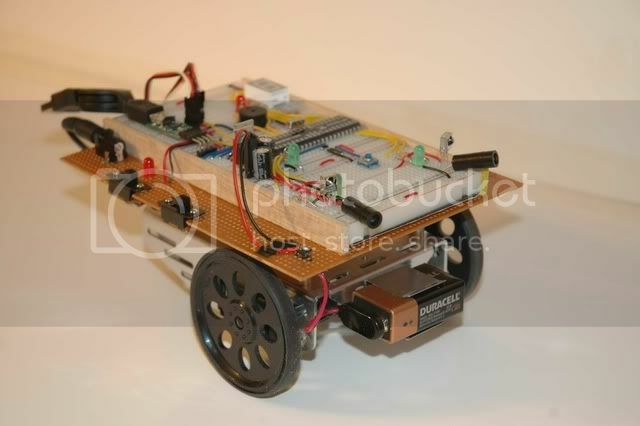 Here's a pic of a breadboard being used as the Control Board of a small robot. So That's my lightening fast introduction to breadboards with a little of why I love them, as you can see they are easily expandable (clipping together) and allow for endless configurations of the same components (until you snap of a cathode like I did). Nice! I like your BOE-bot conversion. Thank you. It was made with Propeller PE Kit (an my BOE-bot) but I totally took the build from one of the parallax moderators who had already done all of the hard work. I've just started my Brat project, I'm trying to hook it up to a propeller robot control board so look out for that in the forum.